Sunrise over the Salzach! In the distance, the sun shone it’s requiem mass, vanquishing the crisp Austrian darkness. The river ebbed and flowed in a rhythmical fashion, as the serene waters convoluted into the rapids. Musicality appeared to be intrinsically carved into nature. A harmonic breeze alluded to overtures of yesteryear, and “the sound of music” cascaded from the surrounding hillside. 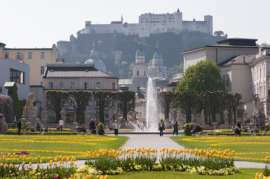 I savoured the air’s alpine freshness and felt in some way connected to Salzburg’s whimsical charm. Possibly my imagination, somehow energized through vision. Or merely a proud city, basking in a grand, artistic history. Upon it’s mountainous peak, the Hohensalzburg Fortress proudly guards the city, piercing the skyline with it’s architecturally Gothic eyes. I meandered through the streets, losing myself in the pastoral beauty of the Mirabell gardens. Subtle shades appeared idyllic, engulfing the glorious Baroque walls of the Mirabell Castle. With it’s nightly concerts and eternal warmth, Mirabell Schloss embodies a botanical stage, paying homage to Salzburg’s artistry. After soaking in the sights, my Bavarian Mountain experience became imminent. A Bavarian feast of historical prominence, cinematic fame, and natural splendour awaited. 1st Movement - A Journey of Intrigue. The tour bus departed. The windows screened a quaint scenery, ranging from tiny antique farmhouses, to the absolute beauty of the Königseeache valley. Within these windows I was lucky enough to discover a humanity of equivalent beauty: Clara. A lady, whose face was etched in ninety years of worldly experience. She possessed a frail exterior, invigorated by a passion for adventure, never lost in age. She spoke of her love, an Austrian romance, divided by culture and separated by War. She had returned to Salzburg, searching for those bygone days and re-sewing the seeds of her one true love. Roxanne and Alex. A unique, recently reunited mother and daughter partnership. They had left the United States, attempting to rekindle a relationship lost through absence. Salzburg, the first stop on a spontaneous trip of redemption. These brief, yet powerful moments, showed me that travelling can be so much more than a collection of sights and sounds. 2nd Movement - An Historical Panorama. We began to rise, slowly ascending to Obersalzberg, the legendary remnants of Hitler’s covert, mountainous retreat. The pictorial quality of the view seemed to escalate like our own ascent. It was Hitler’s metaphorical Eagles Nest, strategically embedded amidst the glory of the German Alps. As a student of History, I gazed across the vast cauldron of snow capped terrain with a certain indifference. A rare blend of evocative panoramas contrasted with a dark, Nazi fuelled aura. Suddenly, I was standing amidst a backdrop that once inspired mass persecution, and induced the very real evils of Adolph Hitler’s mind. I can describe this torrent of emotion as nothing less than stunning. 3rd Movement - An Emerald Paradise Lake Königssee or Echo Lake. Frequented by kings of the past, these crystalline waters were a splendid testament to the blessed town of Berchtesgaden. Surrounded by gushing waterfalls and sojourned by electrical boats, the emerald lake glistened with glee. The area seemed to have a profound affinity with spirituality, as the electrical vessels languidly carried passengers to and fro the Augustine chapel of St. Bartholomew. I could almost hear Echo lake’s eponymous echo, that of novelist Ludwig Ganghofer, stating “Berchtesgaden - He whom God loves, He drops into this land”. The main town concluded the visit, acting as a tranquil resting place, to taste tradition and uncover the exquisite designs of the Princely Royal Palace. In time, I tantalized my taste buds with the delicious taste of a Bavarian Weiss Beer. Smooth and refreshing, it’s uniquely fruity texture seemed to linger in my mouth for hours. 4th Movement - Return to Salzburg. I perused the claustrophobic narrowness of the Getreidegasse. The street had a distinct romantic fervour, with intricately made signs hanging high above the starry arcades. All around, the classical legacy of Mozart could be felt, the Mozart Museum immortalising Salzburg’s favourite child. Diverting from the public eye, I plunged myself into the passive solitude of the riverside. The wind began to arouse the tempestuous instincts of the Salzach. 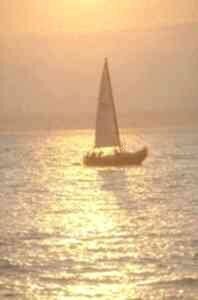 The water was awash with gold and platinum lights, sparkling on the crest of a wave. It appeared my musical rendition was drawing to an end. An orchestra comprised of natural allure and momentous landmarks had played incessantly. Salzburg had been the stage and I was its spectator, indulged with “my own personal symphony”. If you enjoyed reading the above article then you will probably also enjoy Paris by Stewart Collins, and Ireland & Scotland, also in Europe, and our latest articles covering the Orinoco Delta, La Mata, Marbella and Beijing.